We're seeing brands start to remove toxic chemicals from their cleaning products and personal care products as well as food brands remove preservatives and other inflammatory foods from their products to make way for a cleaner way of living and eating. Eating clean is something that's piquing interest all over the country. We're seeing brands start to remove toxic chemicals from their cleaning products and personal care products as well as food brands remove preservatives and other inflammatory foods from their products to make way for a cleaner way of living and eating. I learned how to detox my life from chemicals the last 10 years of chronic illness and I've taught myself how to eat fresh, whole foods and use healthier products around my home and on my skin, since we inhale all the chemicals we're exposed to as well as absorb everything we put on our skin! Something I never realized before my wellness journey from chronic illness to vitality! 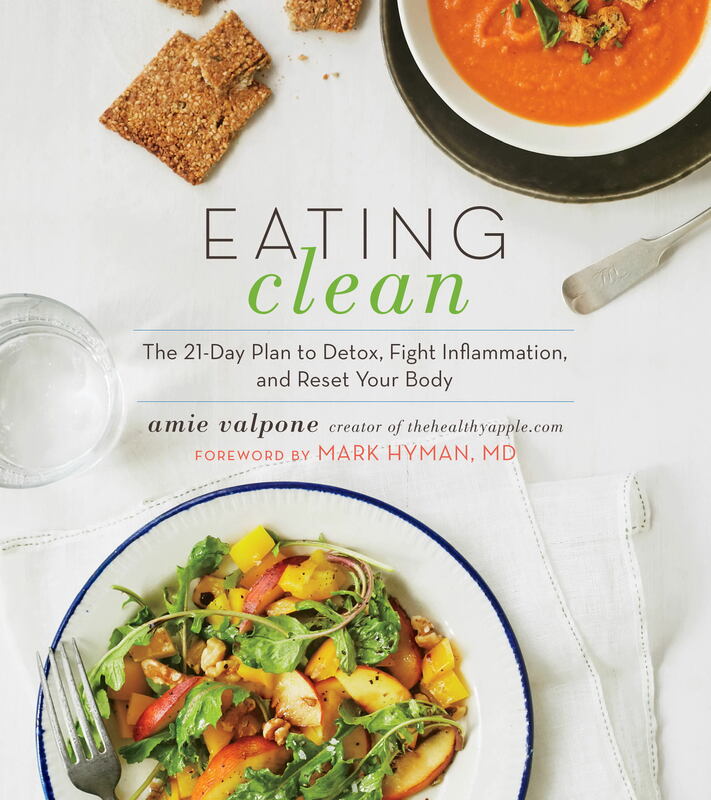 In my new cookbook, Eating Clean: The 21-Day Plan to Detox, Fight Inflammation, and Reset Your Body, I talk about how to start cleaning up your food and your life from chemicals and toxins that are lurking in everything from your ketchup to your toothpaste! My journey to eating clean started ten years ago when I was suffering from a dozen health issues and throughout the last ten years I have learned how to heal my body from a range of symptoms and diagnoses from c.diff colitis to Lyme disease. I started my blog, TheHealthyApple.com to help people suffering from everyday ailments like a headache to chronic illness and my hope is that my new book helps change lives and gives people hope that they can heal and find the light at the end of the tunnel. The fact is that nothing changed until I started to clean up my food and my environment (personal care products, cleaning products and beauty products) because our skin is our biggest organ- so it's important to look not just at what we are putting in our bodies but also what we are putting on our bodies, as well. Detox is not what you think. In this book I outline what you need to do to detox your body on a daily basis and how to eat clean to support your overall health. I want to show you that eating clean feels amazing- not because you should, but because once you see life this way, you'll never go back. There's not a processed piece of candy I'd eat to give up for how incredible I feel. If more people realized what an important role they plan in their own health, they could change the quality of their life forever. I'm sharing 10 tips with you today about how you can eat clean for the New Year and 4 tasty recipes from my new cookbook that are wholesome, fresh and delicious without the gluten, dairy, soy, eggs, corn, refined sugar and processed foods! My cookbook is filled with over 200 recipes that are free of these foods as well as a guide for how to detox your pantry, cleaning supplies and beauty products so you can start 2016 off on the right foot. 1. Reach For One Ingredient Foods. Focusing on one ingredient foods should be the basis of your meals and snacks. What's in an apple? An apple. What's in an avocado? An avocado. Build your meals and snacks around one ingredient foods. It can be done- I've been doing it for 10 years and my new cookbook will show you how to create over 200 recipes with one ingredient whole foods. Nothing processed that's going to create inflammation in your body. 2. Eat Real Whole-Food Fiber. I'm not talking about Fiber from a processed cereal- I'm talking about real fiber from fruits and vegetables and gluten-free whole grains like quinoa, millet and wild rice. That's the fiber you need daily to flush out toxins from your body and help you detox. 3. Be a Smart Snacker. Three meals a day will set you up for blood sugar spikes and drops and will leave you ravenous. Instead, snack every few hours on raw nuts and seeds, carrots with hummus, crackers (I have a handful of grain-free crackers in my cookbook) with guacamole which will keep your blood sugar stable and will keep you happy (and not reaching for the vending machine by 3PM). 4. Fat is Your Friend. Don't fear fat! Our bodies need fat to function properly and your hormones need fat to be at their optimal potential. Trust me, I've had hormonal issues for years and fat has helped me tremendously. However, it's important to focus on healthy fats like raw nuts and seeds, avocado and extra-virgin olive oil. 5. Fight Inflammation Causing You Unwanted Symptoms. Reach for anti-inflammatory foods such as walnuts and flaxseeds, which are rich in Omega 3 fatty acids that help fight inflammation. 6. Remove Toxic Triggers. Remove any foods that cause you symptoms- be mindful because some sensitivities from foods occur up to 48 hours after you eat the food so be sure to take notes when you get bloated or a headache or a rash or feel tired- those are all classic symptoms of a food sensitivity and everyone experiences different symptoms. 7. Choose Healthy Oils. My suggestion is to use coconut oil and extra-virgin olive oil in place of vegetable oils and canola oil, which are refined and often filled with GMOs. 8. Replace Toxic Triggers with Fresh Whole Foods. Replace problem foods such as gluten and dairy and soy with whole foods such as making spreads and 'cheeses' out of nuts and seeds like I did in my book. 9. Reach For Real Sea Salt. Remove that refined table salt and use sea salt and Himalayan pink salt instead of a dose of minerals! Say good bye to that white salt shaker you see on every restaurant table. 10. Add More Fresh Herbs. Add more flavor to your meals by enjoying fresh herbs in your meals to cut down on salt and condiments that you don't need. Try chives, scallions, cilantro and parsley to jazz up your flavor anytime of the year.